Associated Press Notre Dame forward Jessica Shepard has dropped more than 40 pounds since the season began. SOUTH BEND – Boston College found out quickly what it is like to deal with No. 1 Notre Dame's Brianna Turner and Jessica Shepard. On the opening tip, the 6-foot-3 Turner batted the ball to the 6-foot-4 Shepard, who turned, dribbled a few times and scored an easy layup. A little more than a minute later, Shepard returned the favor, her pass finding the quick-cutting Turner for another easy bucket against the Eagles, the 11th straight team to lose to the defending NCAA champs. 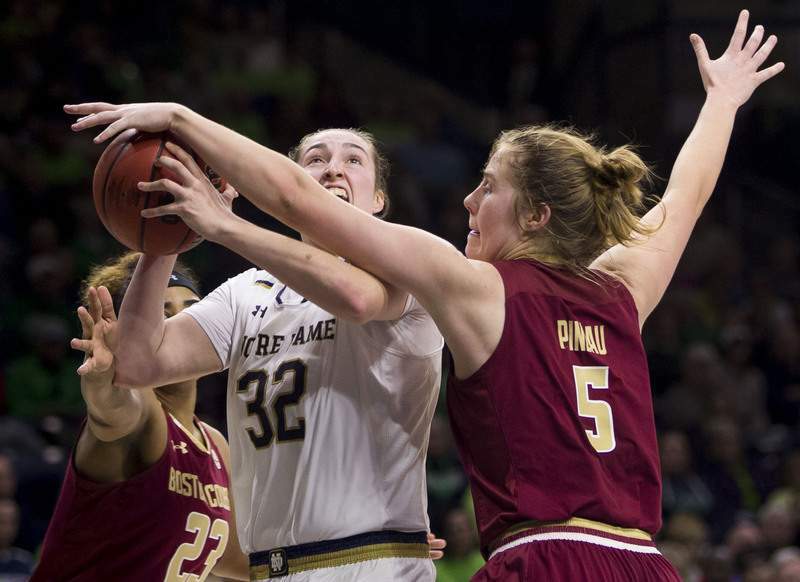 If having to slow down guards Arike Ogunbowale, Marina Mabrey and Jackie Young on the Fighting Irish fast break is hard enough, try doing it with forwards Shepard and Turner starting it. That is the task ahead for unranked Tennessee (12-6), which takes a five-game losing streak into tonight's home game against Notre Dame (18-1). When the teams met a year ago in South Bend, Notre Dame rallied from 23 points down in the first half to win 84-70, the largest comeback in Irish history. This season, Notre Dame averages an NCAA third-best 87.8 points with its five starters all in double figures, led by Ogunbowale's 21.5 points. Shepard averages 14.9 points with 9.2 rebounds and 3.2 assists while Turner averages 13 points along with 7.7 rebounds, 1.4 assists and 2.3 blocks. They have combined for 11 double-doubles (six by Shepard) this season. Turner and Shepard share one more thing: ACL injuries that required surgery. Shepard's came during her senior year of high school before she moved on to become an all-Big Ten performer at Nebraska and then transferred to Notre Dame. An NCAA waiver made Shepard immediately eligible for last season's championship run that was accomplished without Turner, who sat in street clothes after tearing her ACL. “You have to pick your poison a little bit,” Wake Forest coach Jen Hoover said after a loss at Notre Dame last week when Turner had 14 points, 12 rebounds, two assists and two steals and Shepard added 16 points, six rebounds, five assists and four steals in 18 minutes. Coach Muffet McGraw chuckled at the comment but realizes her good fortune. During the streak, the Irish have averaged 21.9 assists and 42.5 rebounds – 9.9 per game better than their opponents. Turner and Shepard are doing that work – and getting out on the break after often starting it with an outlet pass.